Can the man just win in peace and move on to his next conquest, with reputation intact or at best, enhanced? It seems not for Tiger Woods as yet more question marks dogged his 78th PGA Tour victory – and 4th of the season – at The Players Championship last week. Woods was at least able to maintain the status of his ‘friendship’ with Sergio Garcia, following the crowd disturbance that Garcia claims Woods instigated by pulling a club while Garcia was over his second shot on the second hole on Saturday, but his integrity along the way has been called into question again. Garcia flared the shot right and immediately glared in disgust towards the people crowded around Woods as he prepared to play from the left trees. Garcia contended during a weather delay before the 3rd round ended that Woods was responsible for eliciting a roar from the crowd and had not taking due care to ensure his playing partner was not disturbed. Woods disagreed and petulance between the two ensued. However, it seems Garcia may have an axe to grind as reports surface after the tournament that marshals on the hole, who Woods claimed had cleared him to play, say they did not speak to Woods at any time. John North, the chief marshal for the first three holes, concurred. Woods also endured another minor ball drop controversy on the 14th hole in the final round, not long after the smoke had begun to clear from the infamous 15th hole Masters infraction that cost him a two-stroke penalty after the third round was completed and his card signed. Holding a two-stroke lead, Woods sky hooked his tee shot into the water protecting the left of the hole but then appeared to most to have taken a very generous point of entry drop, much further along the hole than TV replays seemed to suggest that the ball last crossed the hazard line. It must be said that the point of entry was agreed with his playing partner Casey Wittenberg despite no rules official being called over to assist, but again, the incident has drawn criticism and debate from golf watchers and commentators in the days since the tournament ended. 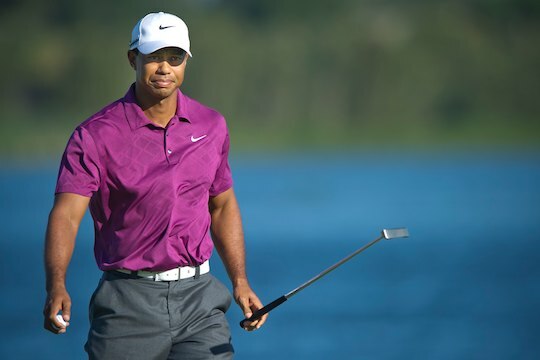 With this win, Woods strengthened his grip on both the world number one position and outright favouritism for the US Open at Merion in a few short weeks. It’s a shame that the brilliance of his form this season is being somewhat tainted by these incidences and the simmering tensions between he and Garcia, which neither party seem inclined to want to resolve, aren’t helping matters. In the fullness of time, Woods may regret not having taken a different course of action with these issues in his unblinking pursuit of more ‘W’s. The price he may pay is in his relationship with the public he has been trying to make amends with following his fall from grace a number of years ago.